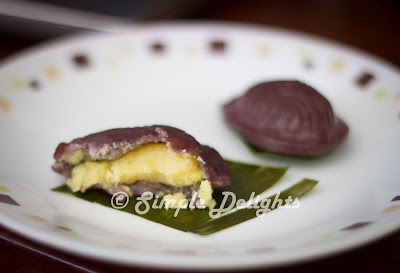 I have always wanted to make the black glutinous rice flour Ang ku Kuih. I was hoping the color of this kuih will be dark shining black . However the result is more a dark purple kuih. When I planned to make this kuih another traditional biscuit was in my mind , so I decided to do a mung bean fillings. The half of this mung bean fillings is used for another recipe ( I hope I can update it soon ) . 1/2 Onion ( original recipe called for shallot) - Finely chop. 1. Combine Mung bean , sugar and salt in a large metal bowl. Mixed well and steam on medium heat for 30min. 3. Heat up the vegetable oil in a wok and stir fried the onion till brown, set aside for later used. 4. In the same wok pour in the mash mung bean and stir fried on low heat till is dry and able to form a ball. 5. Remove from heat and pour in the fried onion and mix well with the mung bean mash. 6. Divide and shape the mung bean into ball shape for later used. 1. Cut purple sweet potato in cube and steam till cooked and mash it finely. 2. Mix all the ingredients till combine , add in the oil at last to form a dough. 3. **Portion the dough accordingly to fit the mould , and wrap the fillings with the dough. 4. 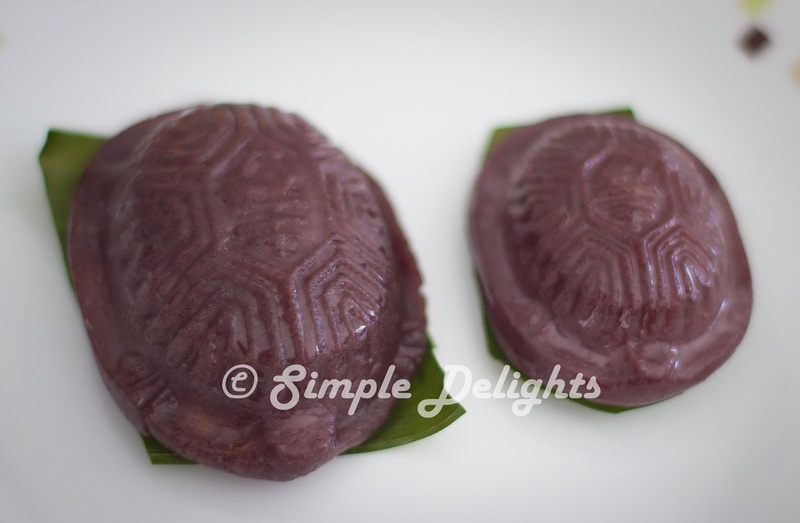 Gently press the dough into the kuih mould that has dusted with flour. 5. Hit the side of the mould and unmould the kuih and place it on a small piece of banana leave . 6. 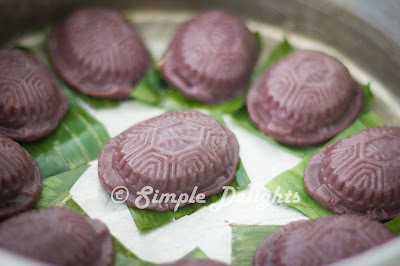 Once finished moulding all the kuih, steam the kuih in a wok with medium heat for 2 min , open the lid let the hot air off closed lid, continue to steam for another 2min , open the lid again and close it to steam for another 1 min. 7. Take the kuih out and brush some cooking oil onto it. Let the kuih cool and serve . I have 2 size of mould . one is tiny one another is consider medium. For medium mould - weigh 13g dough and 10g fillings. The kuih is soft and the fillings is just nice sweetness. I have a few freeze and when have the kuih steam back is still soft and yummy.